The TU Delft Master of Science Programme in Embedded Systems focuses on the design methodology of hardware and software user environments. It covers a wide spectrum of topics ranging from integrated circuit design, computer architecture, communication networks and real-time operating systems to software engineering and formal methods for embedded applications. As an essential component in the inexorable process of miniaturisation, it is an exciting engineering science of the future. Embedded systems are hardware/software systems built into devices that are not necessarily recognised as computerised devices, but these systems do control the functionality and perceived quality of these devices. Some specific examples of embedded systems include: controllers for systems within a car; the automatic pilot of an aircraft; the chip set and software for smartphones, tablets and smart TVs; wireless sensor networks for ambient intelligence, a pacemaker; and control systems embedded in robots/ mechatronic machines. The growth rate in the embedded systems industry is more than 10% per annum and, according to forecasts, there will be more than 40 billion devices worldwide by 2020. Innovations made possible by embedded systems are making our lives healthier, more interesting, safer and more sustainable. These innovations are at the heart of industrial innovation and competitiveness, creating and sustaining jobs and economic well-being. You will obtain basic knowledge through courses on computer architectures for embedded applications, formal verification and quantitative evaluation of embedded systems, and real-time operating aspects. By means of a team project you will experience how all these parts come together when designing an embedded system in practice. Depending on your interest, you will learn more about topics like IC design, heterogeneous computer platforms, network security, wireless sensor networks, internet of things, and mechatronic system design. In the two figures below you can see how the master programme Embedded Systems differs from the other master programmes offered by TU Delft - Faculty of Electrical Engineering, Computer Science and Applied Mathematics (EEMCS). These programmes teach the full spectrum of topics needed to build integrated hardware and software systems. The Electrical Engineering (EE) programme primarily teaches hardware-related topics. The Computer Engineering (CE) programme is more hardware oriented, in addition to covering software-related topics. The Embedded Systems (ES) programme is more software oriented and covers some processing hardware aspects. The Computer Science (CS) programme primarily teaches software-related topics. 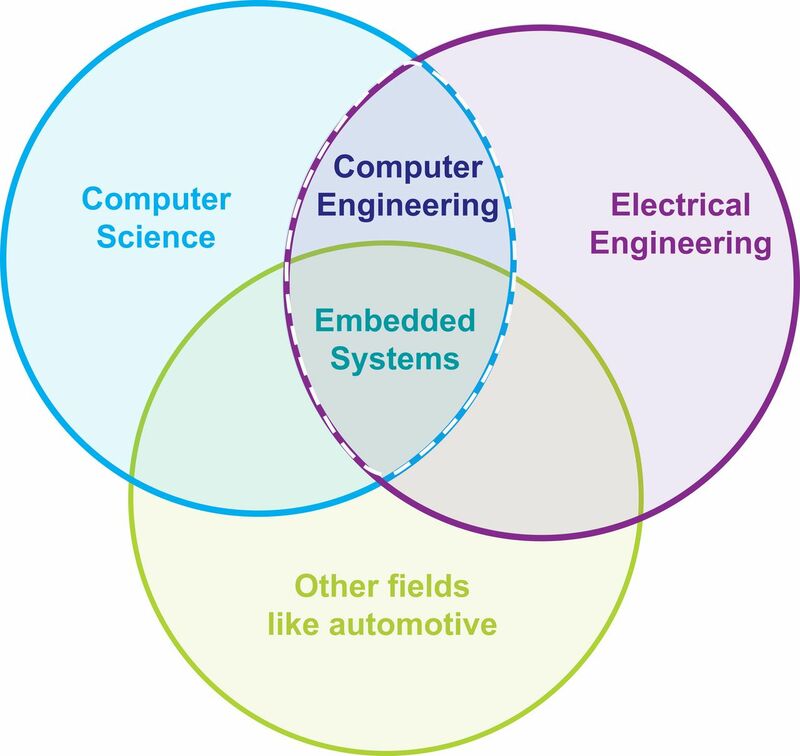 In particular, the Embedded Systems (ES) and Computer Engineering (CE) programmes can be defined as follows. These two programmes have the following similarities and differences. ES has a software focus, CE has a hardware focus. Read more about the scholarship programmes offered by TU Delft. Visit the master event and find out more about our master programmes. Experience the master programme yourself.